There's absolutely no hiding the fact that a quick dip in a vat of hot oil does something sinfully good to a host of different foods. Think classic French fries, beignets, fried chicken, tempura. These are all super tasty treats and, if not for concerns of heart or heft, foods I'd gladly partake in... and, often. Truth be told, if there were no consequences whatsoever, I'd probably deep fry my morning oatmeal. However, being one that profiles more along the lines of a well-seasoned actuary than a throw-it-all-to-the-wind daredevil, deep frying rarely occurs in our kitchen. Having said all that, I do believe in moderation... and happily enjoyed a version of these taquitos on one of our most recent Bay Area excursions. Though our little San Francisco treat was no doubt deep fried, the version I made is baked and... surprisingly... delivers enough crispy character that there is little nostalgia for the taquito from which they were conceived. Unlike more traditional taquitos, filled with pulled pork, beef, or chicken, these little rolls are filled with a sweet caramelized onion and some well-seasoned baby red potatoes, a perfect pairing for the fresh and tangy salsa that gets scooped over top. While they'd be equally good paired with a side of spiced up black beans, or lime- and cilantro-seasoned brown rice, we opted for a a lighter, fresh jicama-orange-cilantro slaw, drizzled with some freshly squeezed lime juice and a good little dash of salt, ground paprika and chili powder. Topped with a fresh and zesty, lime-drizzled salsa of tomato, avocado and cilantro, and a generous sprinkle of cotija cheese, these taquitos are as tasty and enjoyable to consume as if they were pulled from the guilt-inducing depths of a hot fryer. Yet baked with just three or four tablespoons of olive oil (brushed over 10 taquitos) makes them a treat with little to no consequence... unless, of course, you consume the entire platter yourself. I found that the taquitos could be prepped using just a bit more than 3 tablespoons olive oil (for 10 tortillas). Warm tortillas in the oven or over a gas stovetop. This will help prevent cracking or tearing when you roll them. Lightly brush just one side of each tortilla and place the tortilla oil-side down on a foil-lined sheet pan. Scoop about two to three tablespoons filling in the center of each tortilla and roll up jelly-roll style. Place each roll seam-side down and turn halfway through baking to cook evenly. 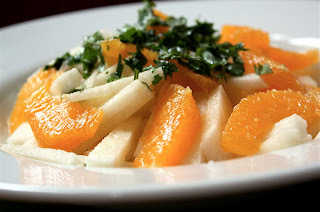 Note: For Jicama-Orange slaw, simply julienne fresh jicama and mix with wedges of fresh orange. 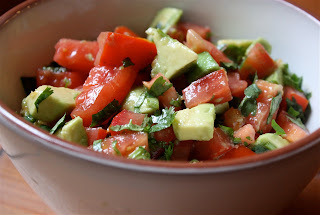 Drizzle with freshly squeezed lime juice and sprinkle lightly with some kosher salt, chile powder and ground paprika. Heat 3 tablespoons olive oil in a heavy skillet over medium heat; add onions and 1/2 teaspoon salt. Cook onion, stirring only intermittently to prevent burning and to monitor heat, for approximately 45 minutes. Onions will soften and slowly begin to brown and caramelize. If they start to burn, turn heat down a bit or add a little water. If you keep heat to a stable medium to medium-low heat, they will caramelize down without any additions. Meanwhile, fill a large pot with water and a good dash of salt, heat over a high flame; add potatoes and boil until just fork-tender. Drain, rinse with cold water to prevent further cooking, and set aside. Heat tortillas and wrap in foil to keep warm; set aside. When onions are done, transfer to a bowl; set aside. In same skillet used for onions, heat 2 tablespoons olive oil over medium heat and add drained and rinsed potatoes; season with 1/2 teaspoon salt and 1/2 teaspoon pepper; sauté for a few minutes to heat through. (You can add a little chopped, roasted pasilla chili at this point if you want a bit more zip.) Add caramelized onions and toss to combine. Remove from heat. Pour remaining 3 tablespoons olive oil into a small bowl. 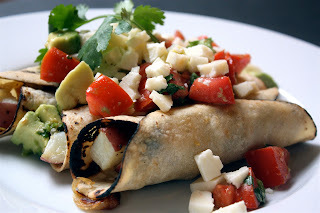 Lightly brush each tortilla on one side only; turn tortilla oiled-side down and fill non-coated side with about 2 to 3 tablespoons potato-onion mixture; roll up (oiled side should be outside facing). Place roll seam-side down on a foiled-lined sheet pan. Continue with all 10 tortillas, placing them on sheet pan with a bit of breathing room. Bake for 7 to 8 minutes, then turn each roll over and bake for another 4 to 5 minutes. While taquitos bake, combine avocado, plum tomatoes, cotija cheese, cilantro, salt, and lime juice to make fresh salsa. Set aside. When taquitos are done, serve topped with fresh salsa and sprinkle with fresh cotija cheese.